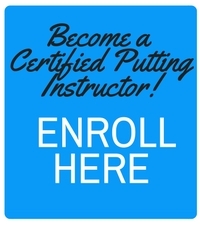 Michael Rae of Drumoig Golf Centre near St Andrews, Scotland is looking forward to the year ahead and is ready to build on his success in 2019 with his new Certified Putting Instructor (CPI) qualification. Rae, who has been a PGA professional for 12 years took the CPI Course (as part of the special PGA in Scotland opportunity) because he felt it was an area where he and his pupils could improve. “Ninety percent of people who come to me for lessons want long game tuition. When I look at my own game I personally have improved my short game and this puts less emphasis on my long game. 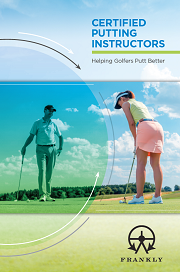 However when I ask my pupils what they are good or bad at, no-one says that they are a good putter, so I felt it was an area that people can improve. “The CPI Course has made me better at what I do. I do a lot of putter fitting and in fact the first ever putter I fitted myself for a number of years ago while I was an assistant at Alyth Golf Club was a Frankly Frog putter. I thought that the CPI Course was a good opportunity to continue learning because the minute you feel you are standing still, you are actually going backwards. The CPI Course is another way I can add to my service and help my pupils. I have had good feedback and results from my customers,” said Rae, who has been at Drumoig Golf Center for 3 years. Rae, who started playing golf at age 3, has a family history of playing golf, with his grandad and his dad being keen golfers. His aunt, who Rae says was the best player in the family, was the Ladies Club Champion at Alyth Golf Club several times. He played for Perthshire and Kinross Boys team from age 13 to 18, then represented the Scottish Boys Team at Westward Ho, Royal North Devon in 1997. He has seen all aspects of golf club operations from the proshop to greenkeeping to catering to caddying, but he finally settled on following his passion for teaching. “I had the opportunity to start teaching and working here at Drumoig with Stuart Syme and it has been great. I really enjoy what I do and Drumoig is becoming very well known as the place in the area for lessons. We are building our reputation in clubfitting as well. We carry multiple brands of clubs and that means that we can find the right set for each customer and good results mean good word of mouth,” said Rae.